Some really scary news about Antarctica melting was in the New York Times today. A radical climate shift is most certainly upon us. I'm sitting in a sweltering office in midtown Manhattan. There was snow in these parts less than a month ago, and it's over 85 degrees today. Instead of running for the presumed safety of the Mexican hills, my humanity led me to an easier escape, one that would not increase my carbon footprint. If any of you have ever found warm comfort in the MLB leader boards on Fangraphs, you'll know the reward. After all, we may as well enjoy everything we can as long as we're on this greasy planet. The Cleveland Indians have two of the top 10 pitchers in all of baseball in FIP (Fielding Independent Pitching), but their ERA's are a rather pedestrian 3.89 (Zach McAllister) and slightly above average 3.48 (Corey Kluber). Their FIP's, which measure the outcomes that are fully independent of the pitchers' supporting cast are 2.61 for McAllister and 2.39 for Kluber, the 10th and 5th best FIP's among all qualified starters in Major League Baseball respectively. These are two of the largest differences between ERA and FIP in baseball, as well. A phenomenon like this could portend a brighter future for these two starters, but it will really depend on whether these pitchers are more so victims of bad luck (which will change) or a bad defense (which must be changed). 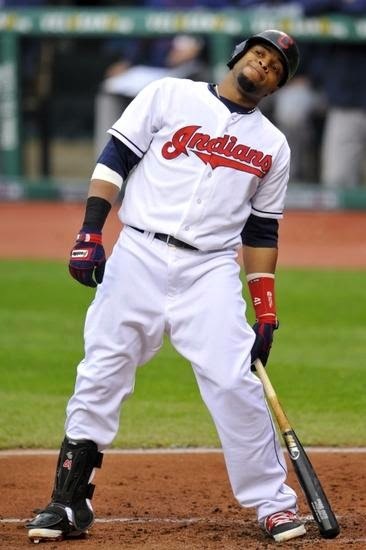 Staying in Cleveland, you probably know that Carlos Santana has been struggling with a low batting average this season. You may not have known that it is as low as .148, or that is the third lowest among qualified batters - only better than Mike Moustakas (.147) and Raul Ibanez (.140). The strangest thing about his struggles is that he's walking more often than he's striking out, and he actually leads all qualified hitters with a 20% walk percentage, meaning that he's walking once in every five plate appearances. It's mid-May, and Troy Tulowitzki is basically flirting with a .500 on-base percentage, currently holding at .497. Chances are that he won't get above the .500 mark again this seasons, but a few hits in this next series against the Royals could make it happen. His season has been so remarkable already, that at 3.1 WARP on Baseball Prospectus, 3.6 WAR on Fangraphs, 4.0 WAR on Baseball-Reference, he's already been worth over 20 million dollars this season, at a conservatice rate around 6 million dollars per Win. Yangervis Solarte has the 15th highest On Base Percentage in Major League Baseball (.394). Seth Smith has the sixth highest (.419). Defensive statistics don't mean much, until you have at least 3 fll seasons worth of data, but just for fun, here are the Top 5 defensive players, according to the Defense rating on Fangraphs. Tulowitzki is incredible. If you look at defensive leaders through the past 3 calendar years, Troy Tulowitzki is 25th among 1,426 players who played in the Major Leagues. With that, I think I'm sufficiently calmed down to face the rest of our peaceful existence. Enjoy the games tonight, everybody!